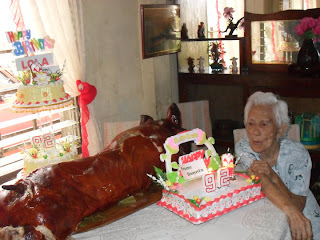 My beloved Lola turned 92 about a week ago. As always, her kids made her birthday special by going out of their way to provide her with a little party attended by them, the grandkids, the great grandkids, and the neighbors. I drooled when I saw the roasted pig. The husband said that was one big roast, lol. She also had ice cream (she loves sweets) aside from her two birthday cakes. By the looks of her, she seemed to have enjoyed her special day. I just wish my family was there to celebrate with her. Happy birthday, Lola. We hope to see you soon.